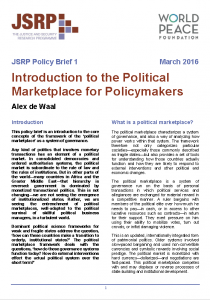 1) De Waal, Alex (2016) ‘Introduction to the Political Marketplace for Policymakers’, JSRP Policy Brief 1, March. 2) De Waal, Alex (2016) ‘A Political Marketplace Analysis of South Sudan’s “Peace”‘, JSRP Policy Brief 2, March. 3) Hoffmann, Kasper, and Vlassenroot, Koen (2016) ‘The Challenges of Multi-Layered Security Governance in Ituri’, JSRP Policy Brief 3, May. 4) Verweijen, Judith (2016) ‘Between ‘Justice’ and ‘Injustice: Justice Populaire in the Eastern DRCongo‘, JSRP Policy Brief 4, August.